When it comes to food, I believe that where we buy our food from is as important as what we buy. Good food choices start with supporting our local growers/ suppliers/ community, as well as growing our own. Whilst I do visit the big supermarkets on occasion, I prefer to buy my food from a Fruit/ Veg Shop, which is supplied by the local farmers and our nearest Co-Operative, which is about 20 minutes from home. I absolutely love shopping at the Co-Op. Not only do members get a discount (yay), but a lot of the foods are available in bulk, and are mostly organic. The Co-Op also has just about everything else you could need- beauty and health products, dried food, fresh food, grains, pulses, chocolate, diary, bread, frozen foods, ice-cream, etc. It is basically a miniature supermarket. 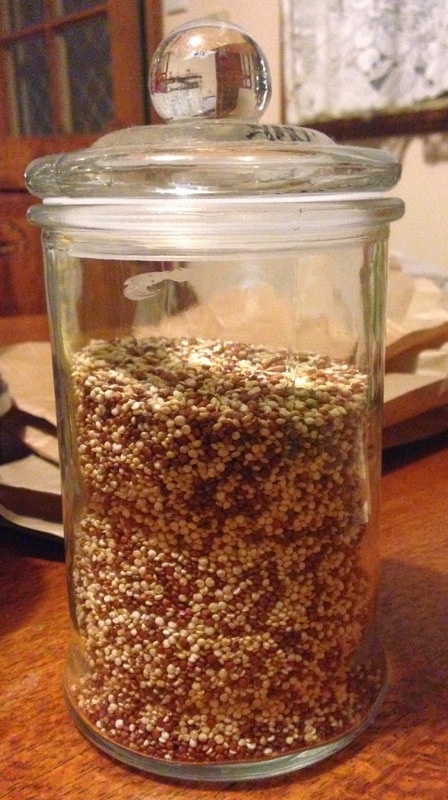 I generally purchase all of my grains and cereals in bulk, using the paper bags supplied at the Co-Op, transferring them into various jars once I get home. The paper bags are then added to my cupboard, to be used for seed saving. 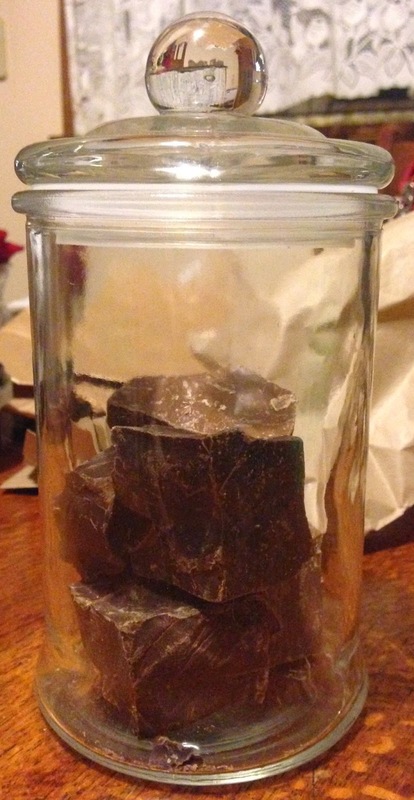 My favourite items are Couscous; the handmade chocolate; and the handmade bar soap- which are only $1.95 per bar. I also regularly biodegradable bamboo toothbrushes; herbal toothpaste; essential oils; raw honey; raw Apple Cider Vinegar; etc when we need them. As we only visit the co-op about once per month, I keep a list on the fridge of items we have run out of, or are getting low on. I then take this list along with me to ensure I get everything we need, avoiding wasting money by doubling up and having food stuffs go bad. The other place I go shopping is in my own garden. 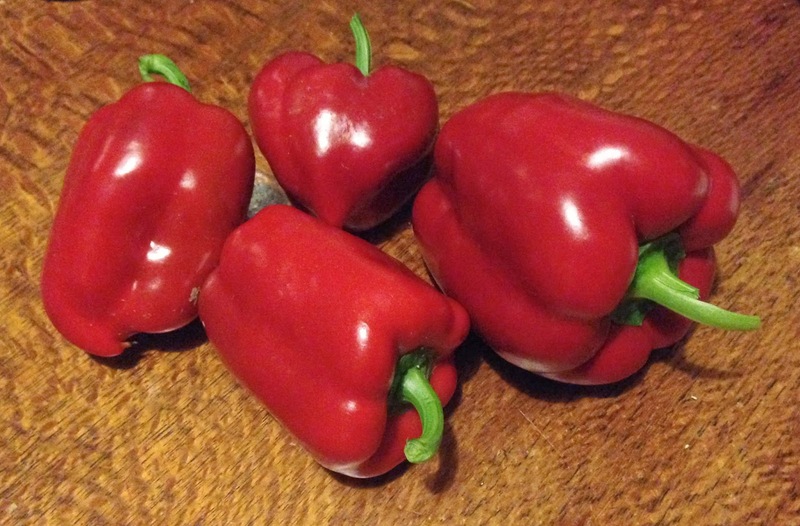 Over the last three weeks, we've had approximately 15 capsicums from our capsicum bush. I grew the capsicum bush accidentally, from seeds I threw in the garden at some point. I'm not a huge fan of capsicums, I only like them roasted. 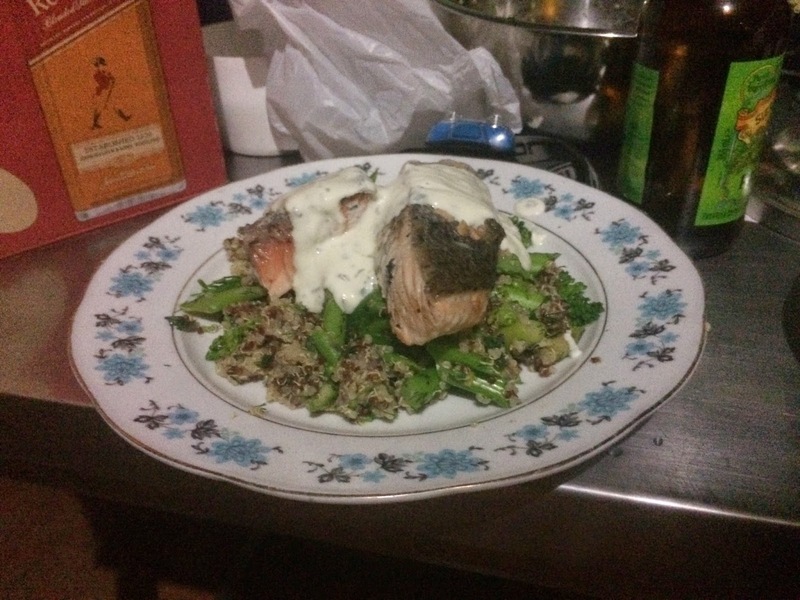 So I've been getting crafty in the kitchen, incorporating roast capsicums into our dinners. My favourite was Roast Capsicum and Pumpkin Soup. - Peel and chop brown onion and garlic, add to chopped celery and brown in a large saucepan with butter. - Peel and chop pumpkin, add to saucepan. Add water until pumpkin is just covered. Add the sprig of rosemary. - Once water is boiled, lower temperature and simmer until pumpkin is cooked through. - The Capsicums should be roasted by this stage. The skin should be blistered. - Remove capsicums from oven, cut open and remove seeds. Roughly chop capsicum and add to soup. - Using a stick mixer, blend the soup into a smooth consistency. If the soup is a little watery, remove lid and increase heat, to evaporate off some water. - Once the soup is thick, add the can of coconut cream. - Allow the soup to heat to preferred temperature and serve. 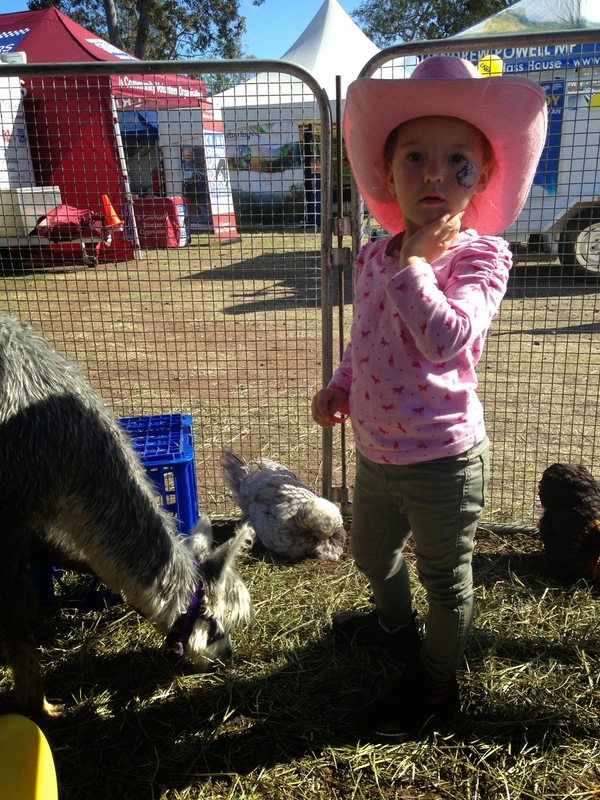 One of the local shows was on last weekend, so I took Gigi along to see the animals and the ring events. She had an absolute blast and I had a good time too. I haven't been to a Country Show for a few years and the last time I went, it was pretty sad. There weren't many competitors, nor were there many ring events. All of the Judges, Competitors and Organisers were elderly and I wondered if eventually the whole 'Country Show' would die out. However, there seems to be a resurgence of interest and participation in the small Shows. There were lots of families attending the shows; lots of competitors- both young and old; and lots of Organisers of varying ages. Hopefully the Shows will be here for some time to come. I'm thinking in future years, I might join the Show Society and volunteer to help out at the Show. I don't want to see the tradition die out, and unless new people take an interest and join up, at some point it'll be no more. 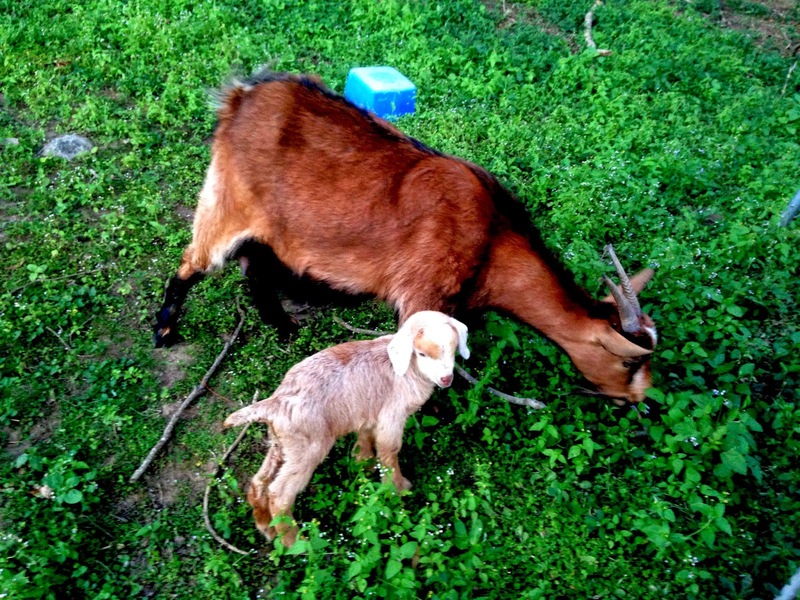 The nannies have started to kid and this seasons baby goats have slowly been arriving one by one. 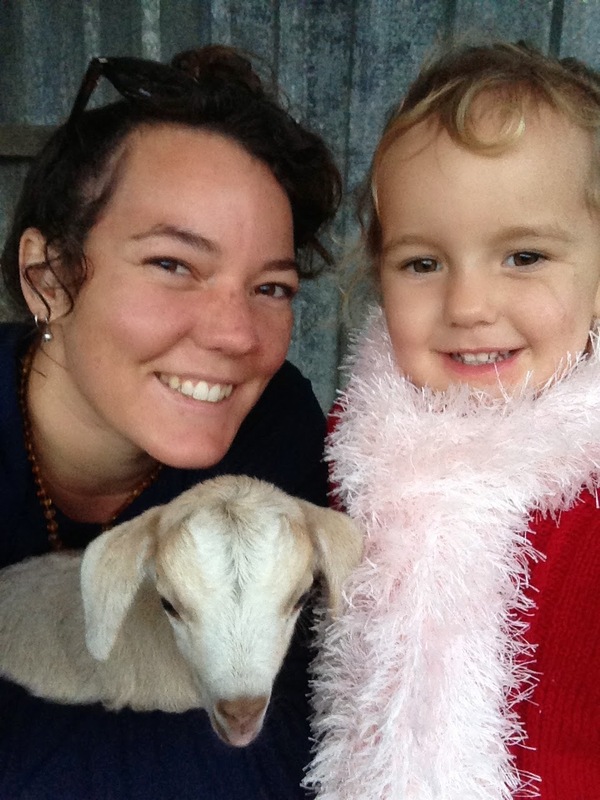 Gigi is so excited by the kids, every time we go out to look at them or feed the mothers, she tells me "I love the baby goats Mumma". At first she was a little confused about where they had come from, she kept asking me if Poppa had bought them. 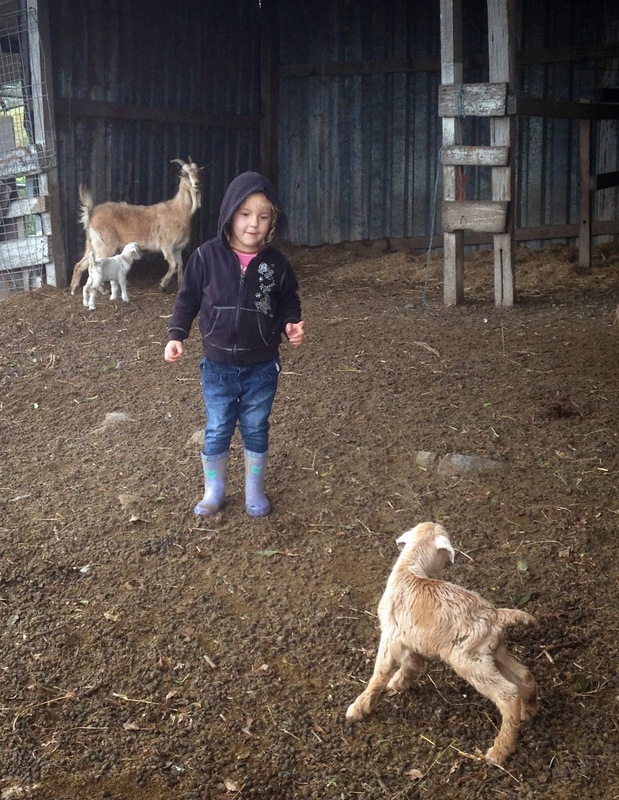 I explained that they grew in their Mumma's tummy and then they were born. She now picks the kids up and tells them "You are so cute, you were in your Mummas tummy". The nannies and kids were isolated in the 'nursery pen' for a few days to ensure the babies were feeding correctly and that the mothers were looking after their offspring. In past years, the mothers (especially first time mothers) have the kid, then walk away. Other times, they've had the kid, looked after it for a week or so, then just given up. After loosing a few kids over the years, I have learnt the importance of separating out the mothers. 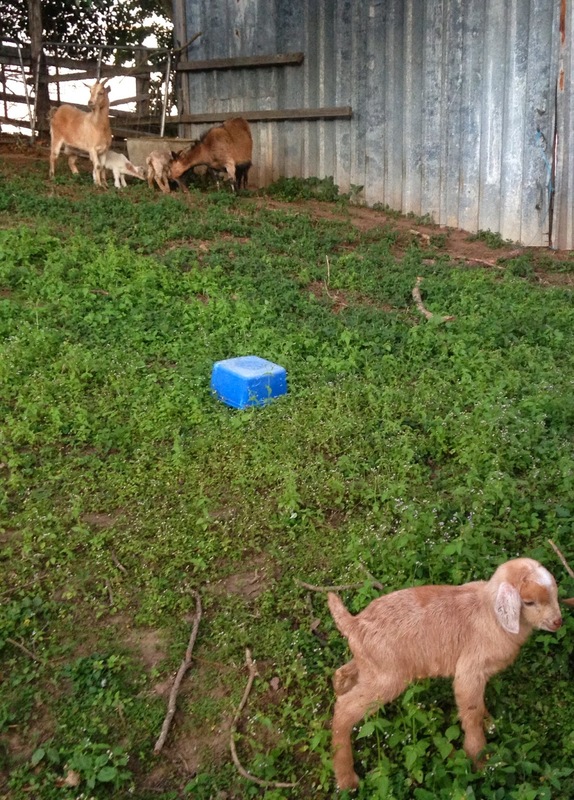 If you don't keep the nannies and kids in a separate and smaller paddock to the main herd, it is harder to keep an eye on them and identify problems as they arise. 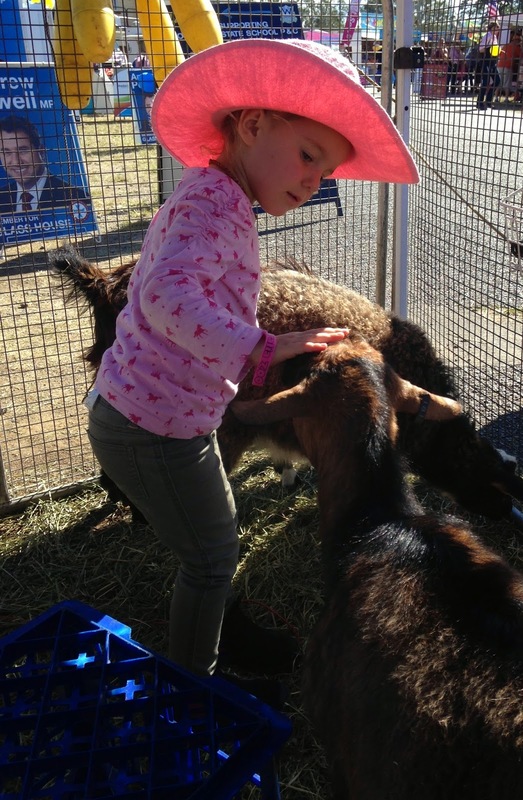 Also, in a small pen, the kids are easy to catch and pick up for cuddles. By about four days old, they are very fast and hard to catch. So far we have had four kids born to four nannies. One female kid and three males. The males will be castrated to be whethers, which I will write about in a future post, at the time. Whethers are much easier to handle, don't smell and are much easier to sell on to others. 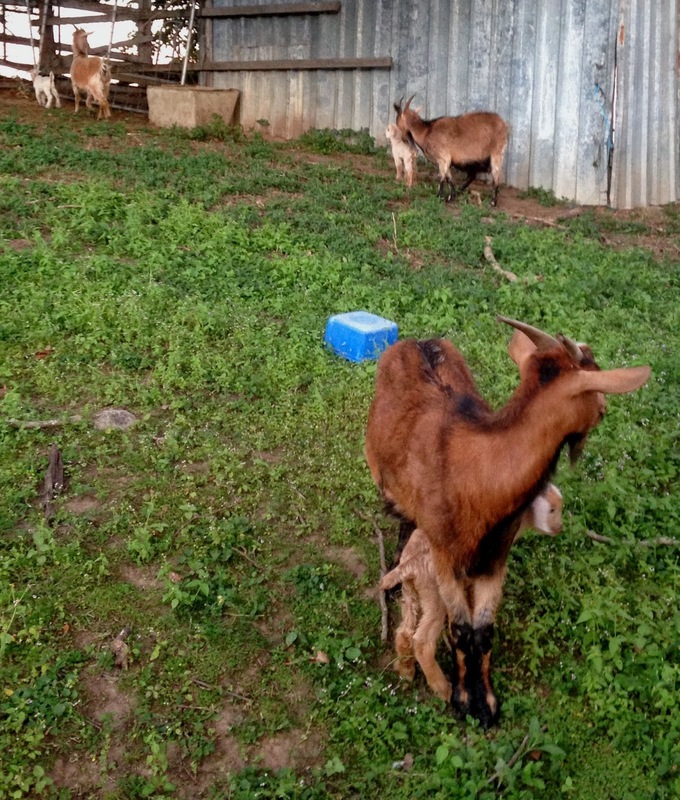 Also, with a small herd its important limit the number of billy's' to prevent fighting between themselves and also to prevent inbreeding in the herd. There are another three nannies due to kid sometime in the next two or three weeks. Two of the nannies usually have twins, so I'm expecting twins from them again this year. The other nanny is pregnant, but looks small, so I think she will only have a single kid. The lovely ladies took up residence at my parents house three weeks ago and they are settling in nicely. 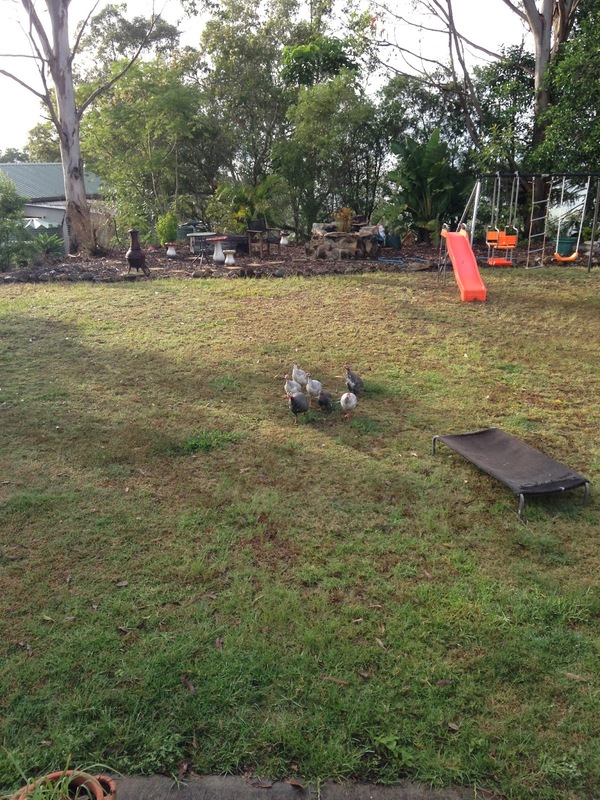 Every morning they are let out to wander the house yard and every evening they put themselves away in their chook house. 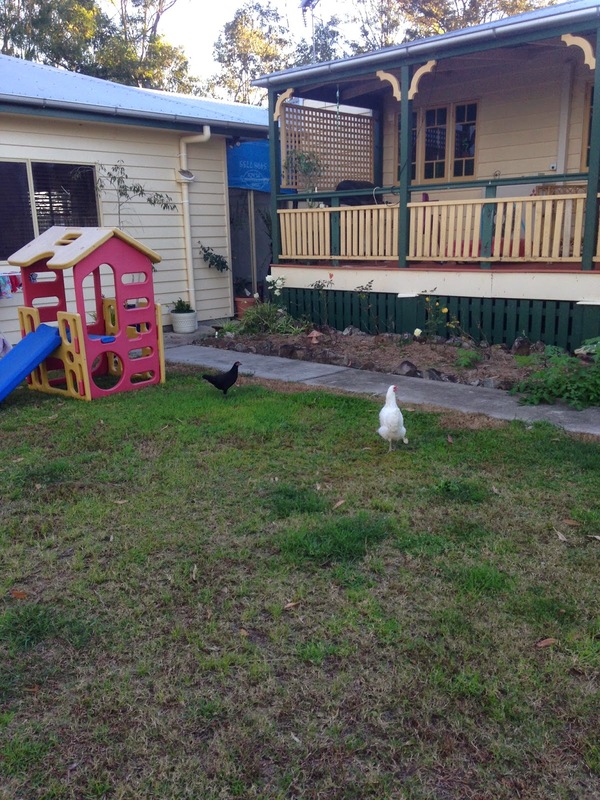 To start with, they limited their exploration to the gardens around their chook house, but everyday they explore a little further afield. My suspicions of their personalities have turned out to be correct- Fly (brown) is quiet and friendly. She is the easiest to catch and seems to enjoy a cuddle. 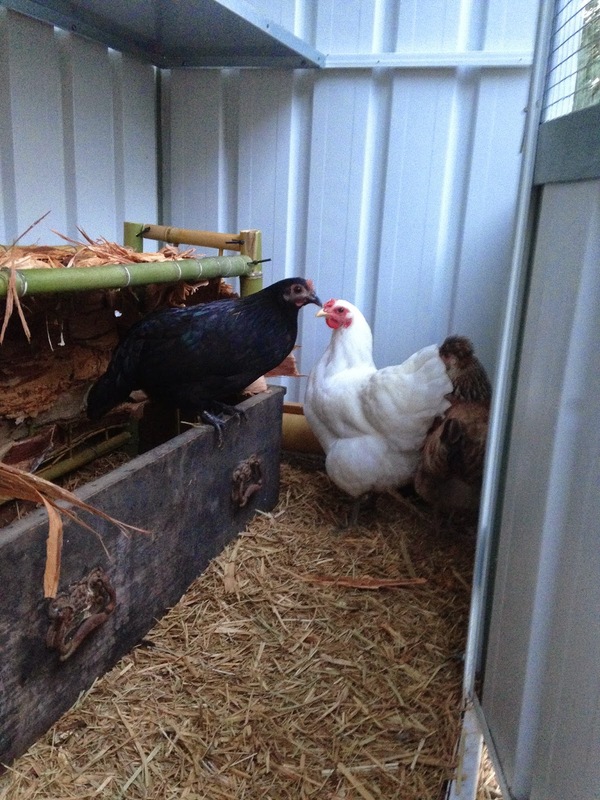 Chicken Dance (white) is big and docile, whilst In The Box (black) is quick and crafty. As I predicted, Gigi loves the chooks. Fly has emerged as Gigis favourite, possibly because she is very quiet and doesn't struggle when being held. 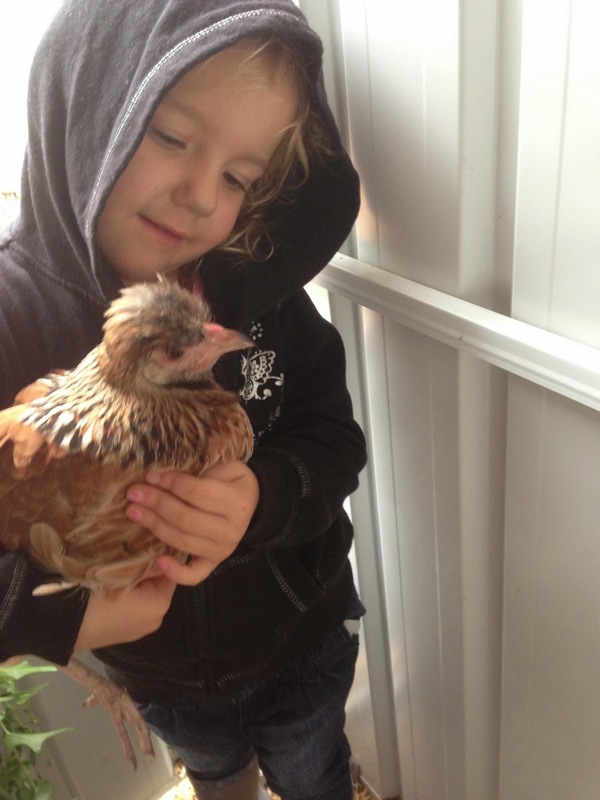 She is also much smaller than Chicken Dance, whose larger size is a little intimidating for Gigi at the moment. For myself, I just love watching the girls as they wander around the garden, scratching in the mulch and the grass on their hunt for insects. I find it incredibly relaxing and endlessly interesting watching them do their thing. As mentioned in previous posts, my parents wanted some chicken for their lovely fresh eggs. My dad built a small coop and I built a water trough, a feeder and a nesting box. 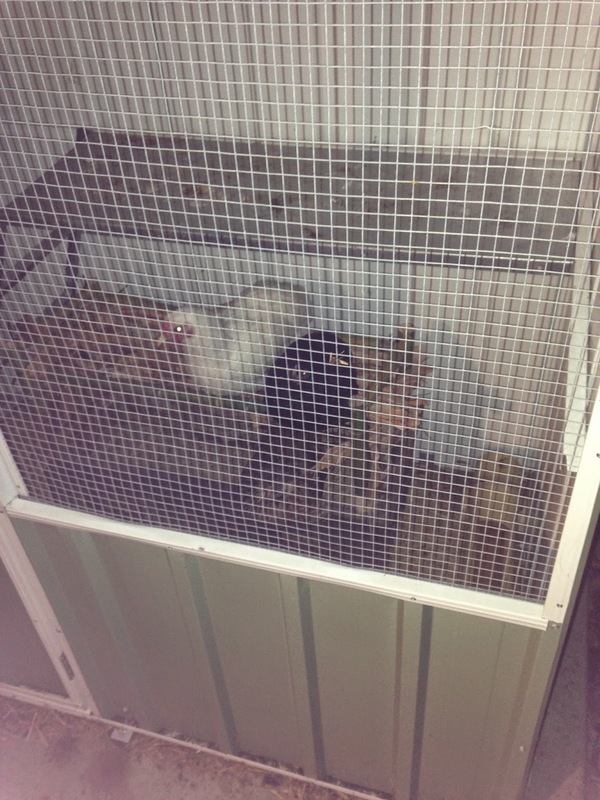 I then purchased three cross-bred backyard chickens from the local markets. 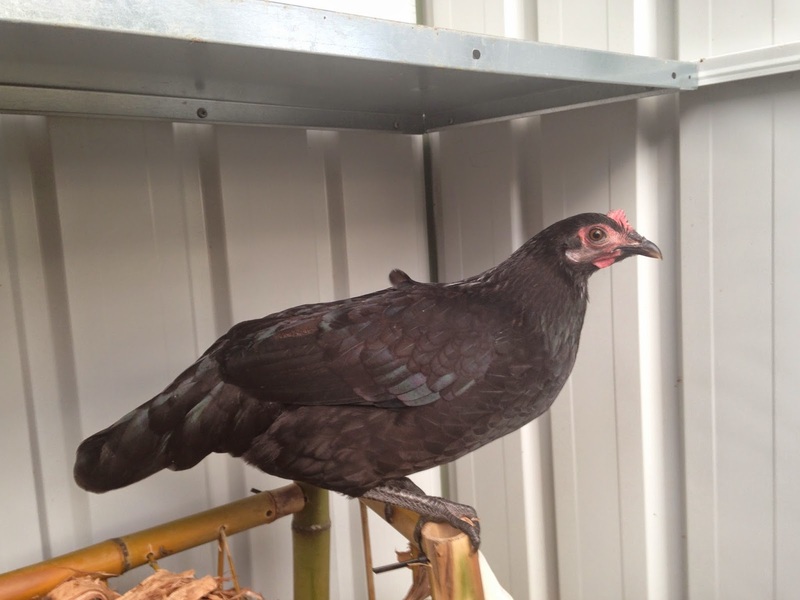 I chose cross-breeds because they are supposed to be quite hardy and as mentioned, its been a while since my parents or myself have had chickens. I also chose cross-breeds because they are much cheaper than pure breeds- $10/bird as opposed to $30-40/ bird. Gigi is very interested in the chickens and was very excited to give them names. She has chosen 'Chicken Dance' for the white chicken, 'Fly' for the brown chicken and 'In the Box' for the black chicken. Already they have their own strong personalities showing through. 'Fly' is very quiet and gentle. I think she will come for cuddles and pats soon enough. Her colours are lovely and she has an interesting hair-do. 'In the Box' is a small bird, very observant and wary. I think in time she'll be friendly enough, if it suits her. I also have a feeling that she'll be the trouble maker and is the most intelligent of the three. She has lovely black feathers, with a colourful shine in the sun. 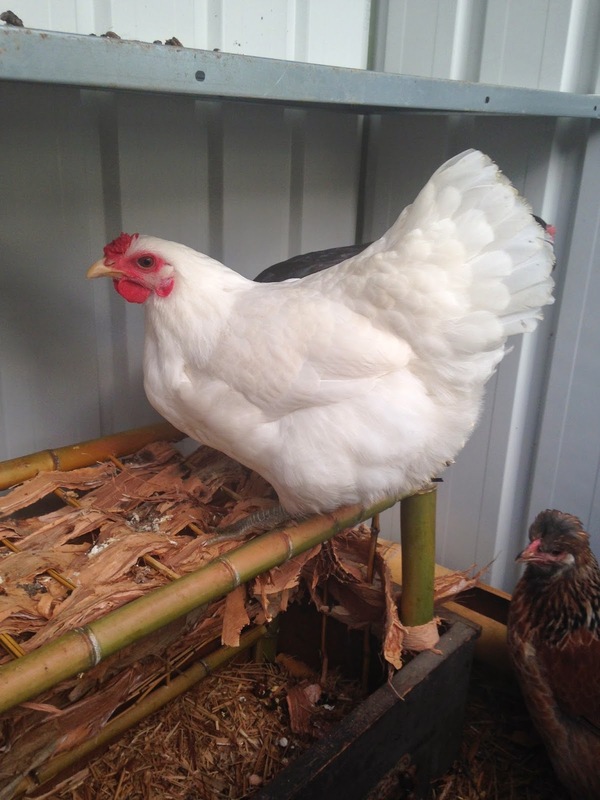 Chicken Dance is the biggest girl and is at the top of the pecking order. She is big, loud and a bit dopey. 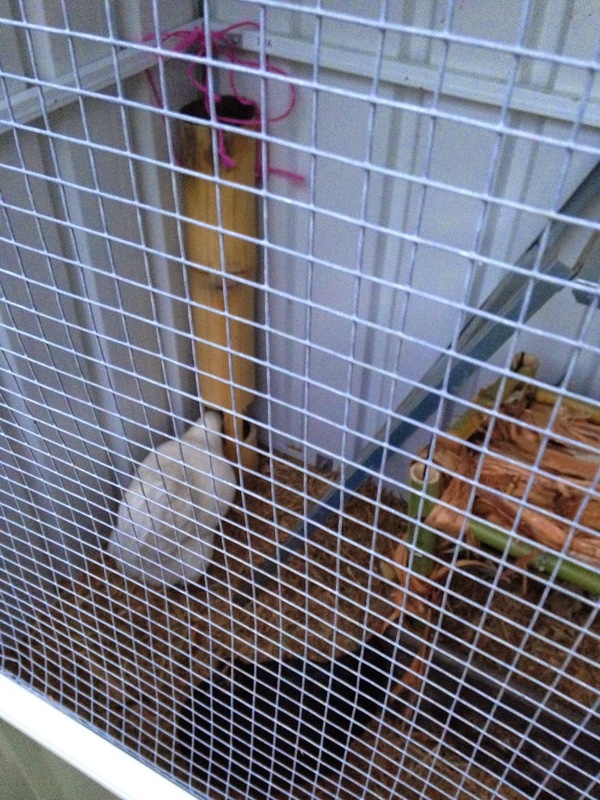 She is pure white with a large comb and wattles. 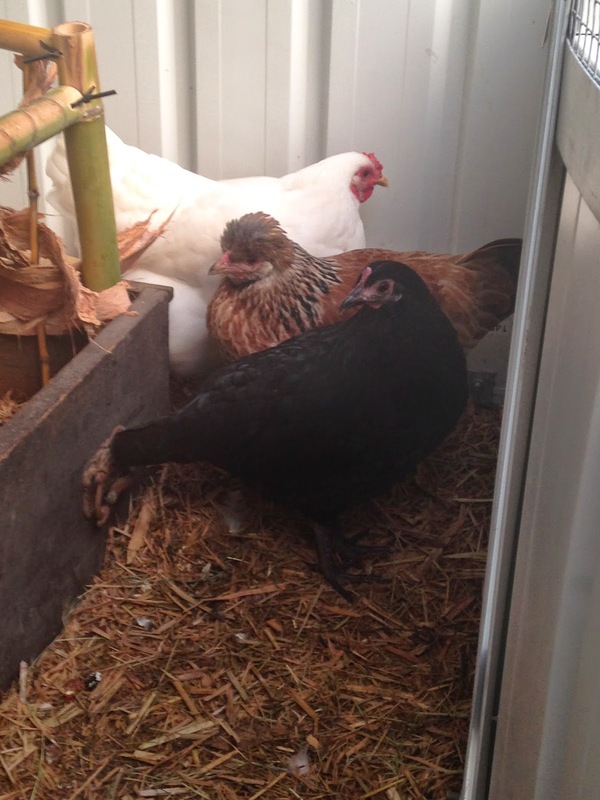 The girls will be let out to free-range this weekend and I am looking forward to watching their antics in the garden. The June long-weekend just passed and Gigi's father came down for a visit. We are lucky enough to have a reasonably amicable co-parenting relationship and both want to give Gigi wonderful childhood memories (as most parents do). 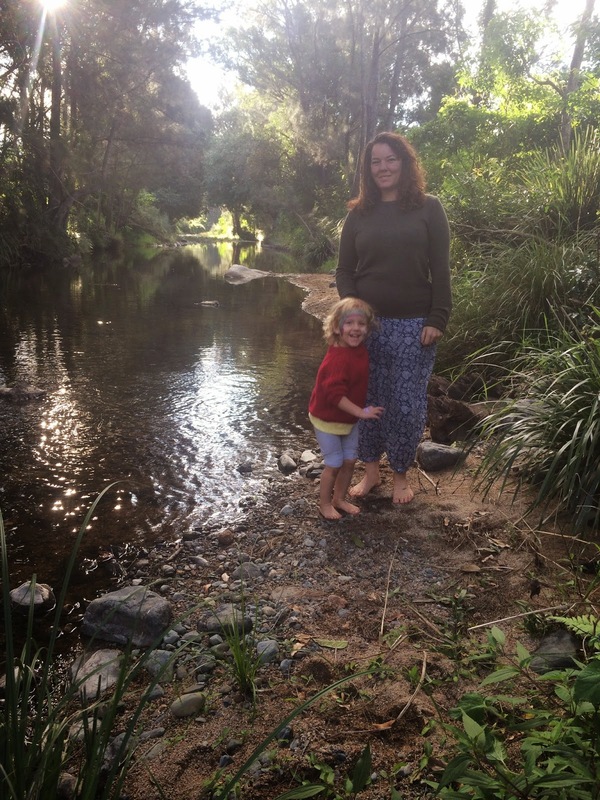 Gigi's father wanted to take Gigi camping, so we organised a trip to Crystal Waters Eco Village on the Sunshine Coast Hinterland, about an hour away from home. Gigi and her father playing by one of the many creeks. 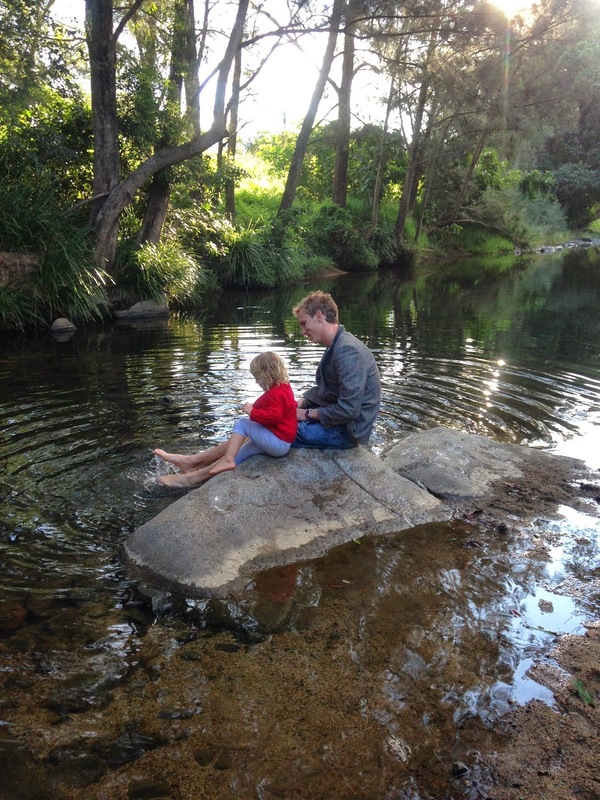 Crystal Waters is an alternative community set in 650 acres of bushland. The community includes a number of private residences, village green/ common area, bushland reserves, creeks, lakes and the village camping area. The community holds a market on the first Saturday of every month, selling everything from fruit and veg, to plants, clothing, handmade goods and second-hand items. 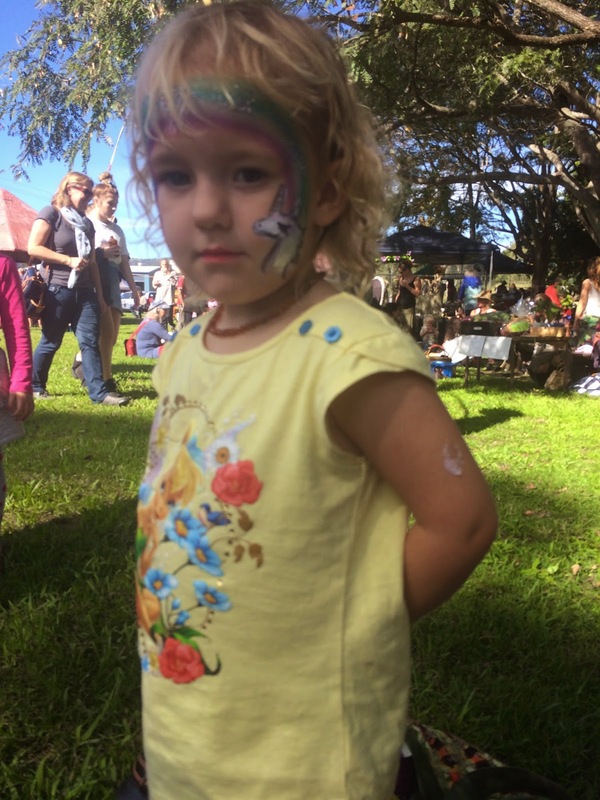 There were also several small bands playing, delicious food and kids face-painting. 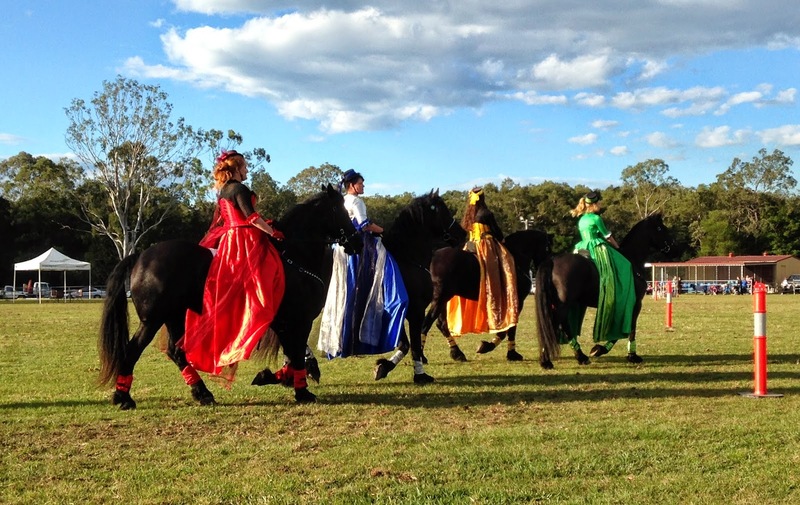 Its was almost like a small festival, or a village fete from medieval times. Best of all, there was about twenty kids of all ages running around, playing together and not an electronic device in sight. Gigi had an absolute blast. The village camping area was a short 300m walk from the village green and was surprisingly luxurious. I'd packed an array of cooking equipment to cook over the campfire and an esky to keep our fruit and veg cold, but it was completely unnecessary. The camp area included a camp kitchen hut, which had two refrigerators; gas cooker; sink; kettle; toaster; microwave; cutlery; crockery; pots; pans; and utensils. We still had a campfire every day and cooked all our meals over it, but having the use of a fridge and proper washing up facilities was amazing. As an added bonus, the camping area also has real toilets, hot showers and a laundry! All for $10/per adult/ night! But the best thing about the camping itself was the surroundings and the company. Three other families with kids also stayed at the campsite for the weekend, as well as a German backpacker, a couple and a single. During the day, everyone did their own thing; but of a night, everyone gathered around the campfire and shared food, wine, tea, hot chocolate, marshmallows and great conversation. All within a beautiful backdrop of native bushland. It was a great weekend, one that I hope Gigi will remember and that I also hope we can repeat in the future. 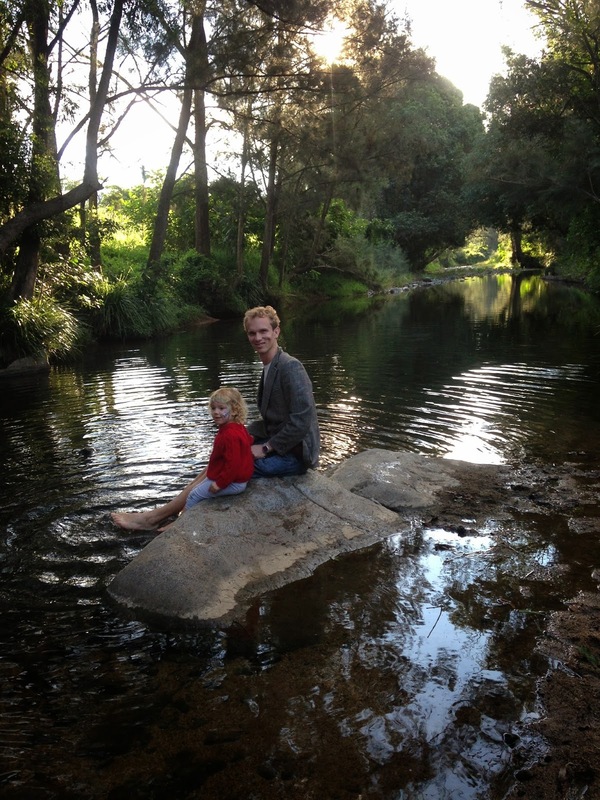 I would definitely recommend Crystal Waters Eco Village as a wonderful camping spot. 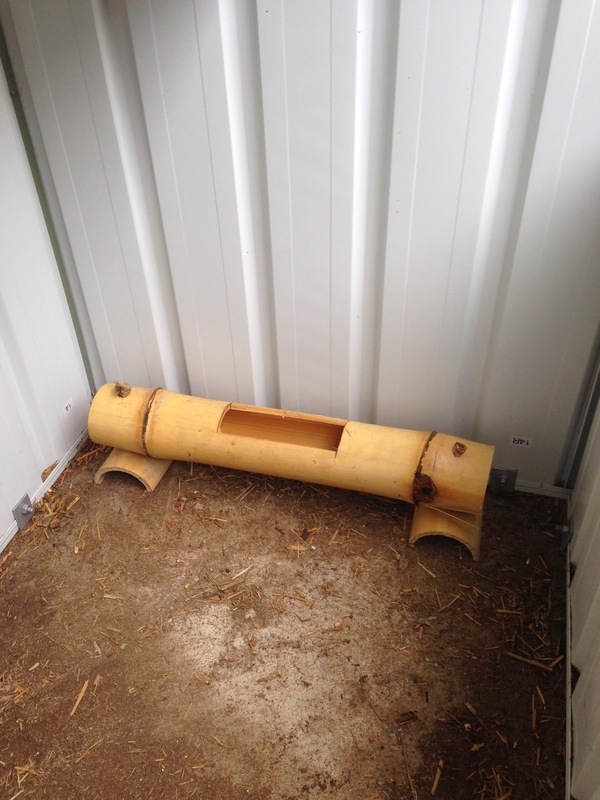 Part 3 of my DIY Weekend involved building a nesting box. I left this to last because I had put qa lot of thought into how I was going to build it. When I first bought my block, it had not fences and people would often dump rubbish on it. Usually cans, wrappers and the occasional random item. One day I discovered a wooden drawer a passer by had gifted me with. Whilst old, it is in perfect condition, so I kept it to use for a project. I was thinking it'd screw some wooden legs on it and make it into a planter box. My dad then suggested that I should use it as a nesting box. 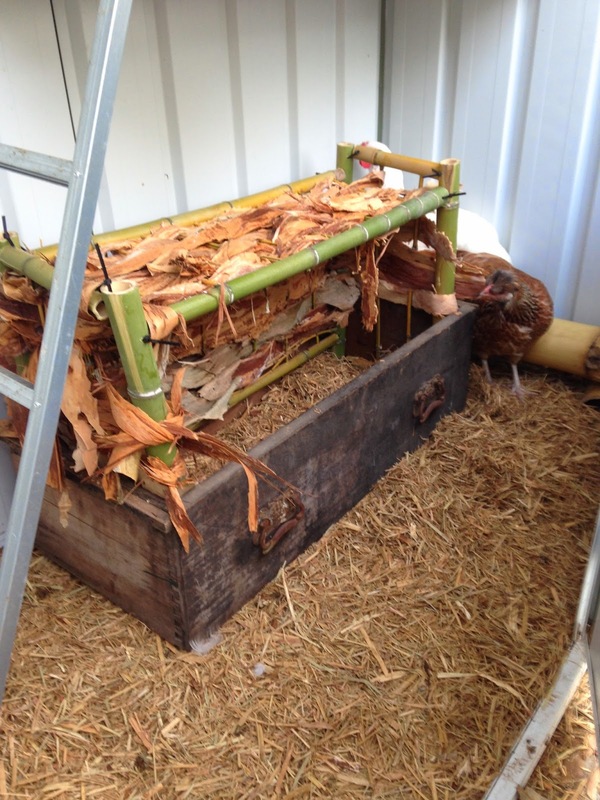 The drawer is so old, any toxins in the wood would be long gone, so perfect and safe for chickens. I cut four thicker lengths of bamboo about 40cms long to make corner posts, four long lengths for 'beams' and floor 'stabilisers' and four short lengths for 'beams' and floor 'stabilisers'. I then assembled inside the drawer, as show above to ensure all the pieces fit. Several had to be trimmed to ensure they were the correct length. I then drilled holes in the ends and connected all the pieces with zip ties. 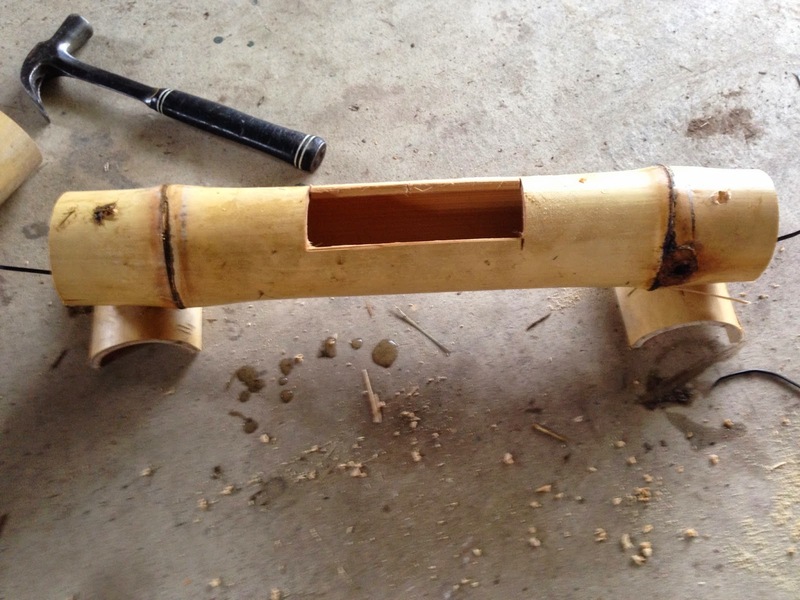 Next I drilled holes along the top and bottom pieces and inserted thin pieces of bamboo the entire length of the box. Unfortunately I didn't take a photo of this step. The thin lengths of bamboo gave additional support to the structure. I planned to weave very thin pieces of bamboo through the supports to create something like a woven basket. I wove about half of the rear wall before deciding that it was too time consuming and I couldn't get a tight enough weave. I then considered using rags and doing a cloth weave, but I didn't want to waste my cleaning rags. Then I remembered that as a kid, my neighbours and I used to make huts out of branches with paperbark woven between the branches. I thought that the same technique could be used for the nesting box. And it did. The completed nesting box is a little messy-looking but I like it. 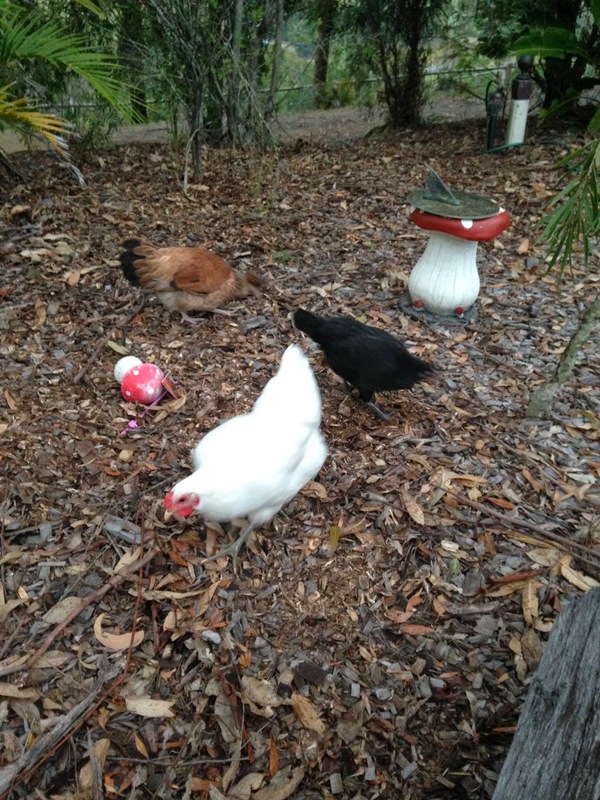 And the chooks seem to like it too. All three DIY projects in the coop. 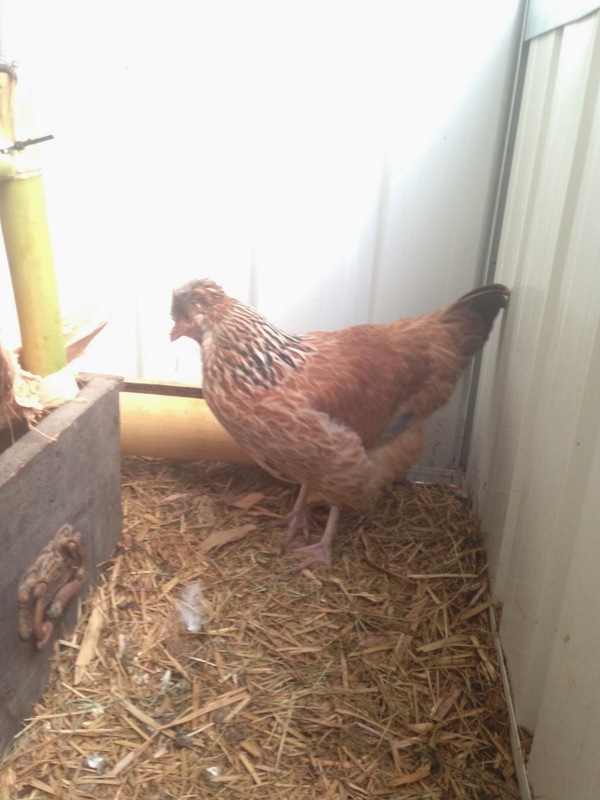 one chook is in the nesting box. Now all I have to do is wait until the girls are old enough to start laying and there will be fresh eggs to be enjoyed. 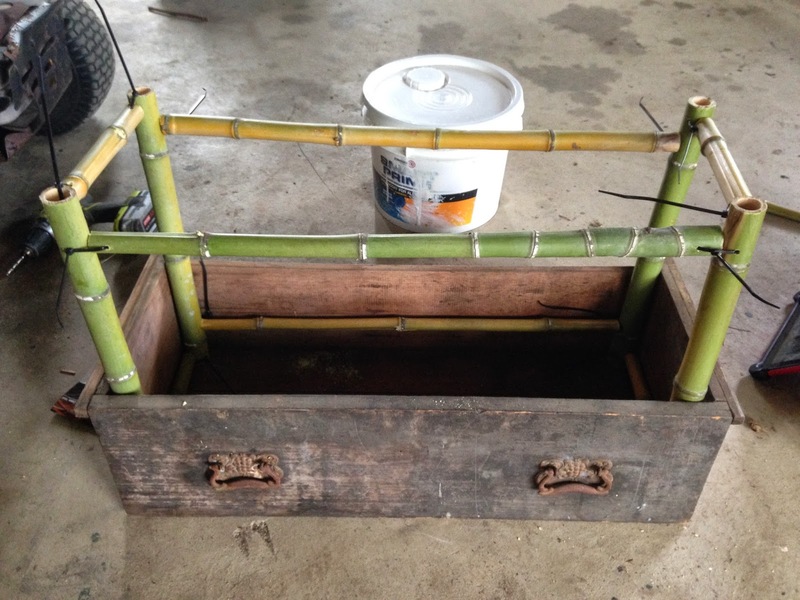 After building a Bamboo Water Trough, I decided to use the same basic principle to make a Bamboo Chicken Feeder. 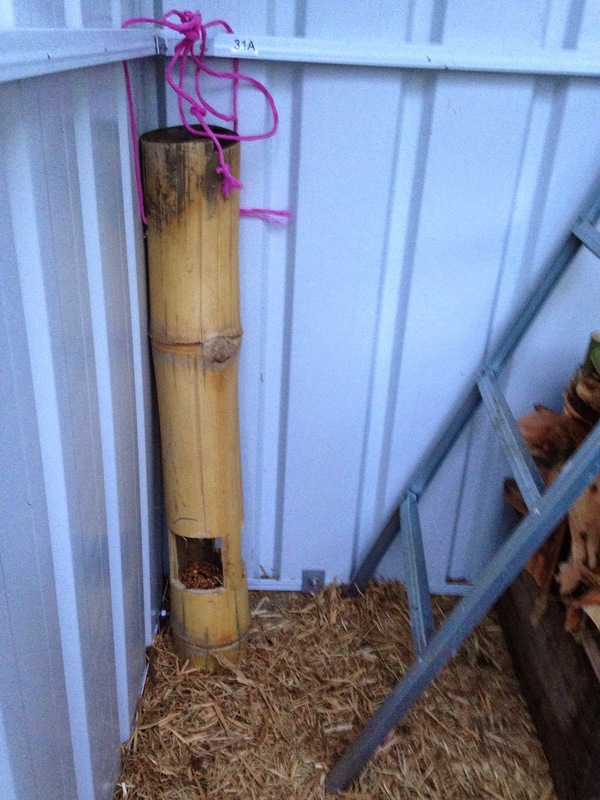 Once again, I used an entire segment of the bamboo, so that the chicken feed would sit IN the bamboo piece. The bottom of the bamboo is acting as a bowl, I guess. I cut two large squares out of the bottom of the bamboo. 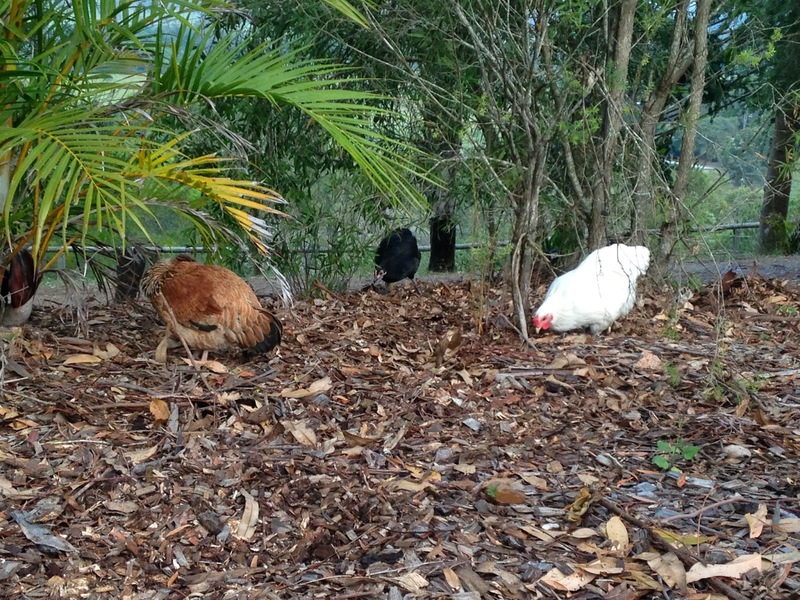 The idea is that the chooks can easily get to the grain, without pooping in their food. I've cut two squares so that at least two chooks can feed at the same time. 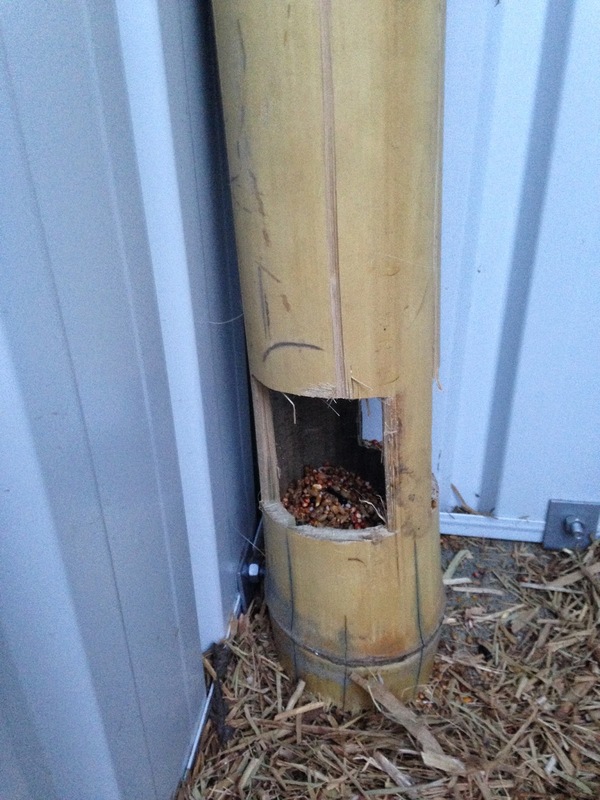 I also drilled two holes at the top of the feeder to that it could be tied-up for security. The chooks immediately got the idea and came over to enjoy their feeder. My parents have decided to get some chickens. Their main purpose would be as egg producers, but also as pets. Its been 20 years since my parents had chickens. We had them for a few years as kids, but our cattle dog and foxes eventually ate them all. 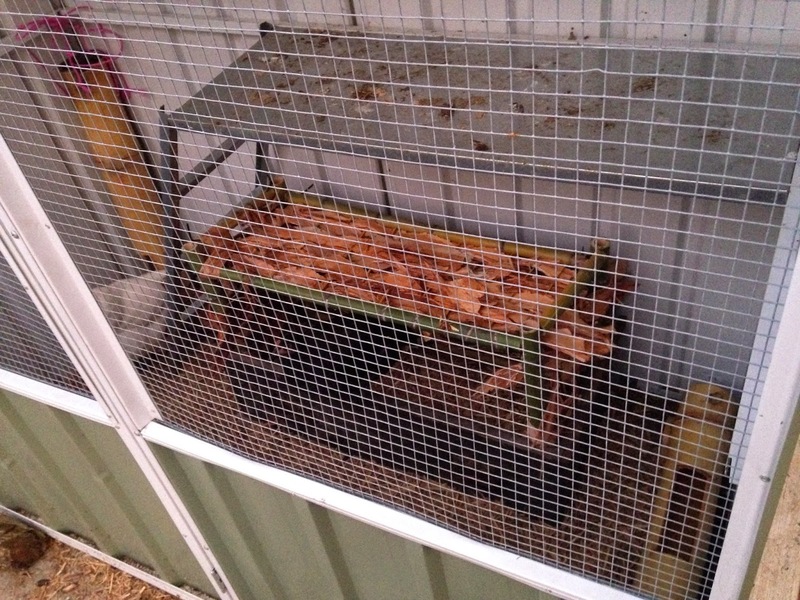 My dad built a chicken coop a few weeks ago from a kit and its been settling/ airing since. Chickens need three basic things- Food, Water and Shelter. I've decide to build a Water Trough, a Feeder and a Nesting Box from whatever I had lying around or could source for free. So basically, this meant Bamboo creations. 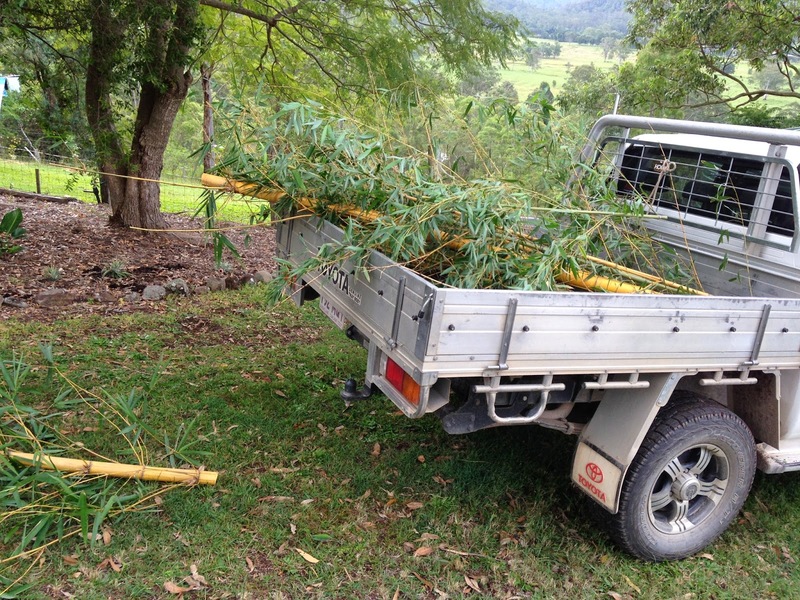 I went and harvested a heap of Bamboo from where it grows on the roadside not far from my parents house. I went to a 'Building with Bamboo' Workshop at The Planting Festival, back in May. From this Workshop, I learnt that Bamboo is best cut down with a fine-toothed saw. Turns out its true. 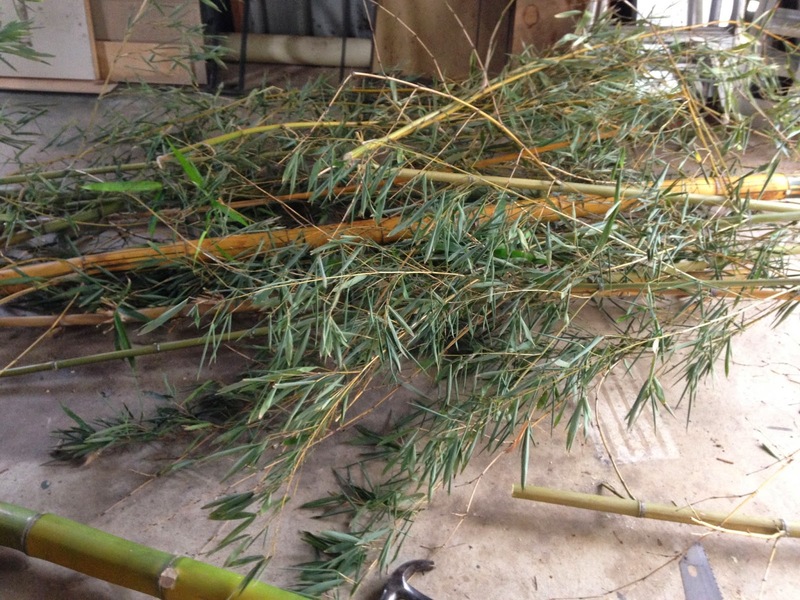 The last time I cut Bamboo, I used my large-toothed pruning saw. This time I used a run-of-the mill building saw (can get them for about $7 from Bunnings). Wow, was it so much easier and faster than the struggle of the large-toothed saw. 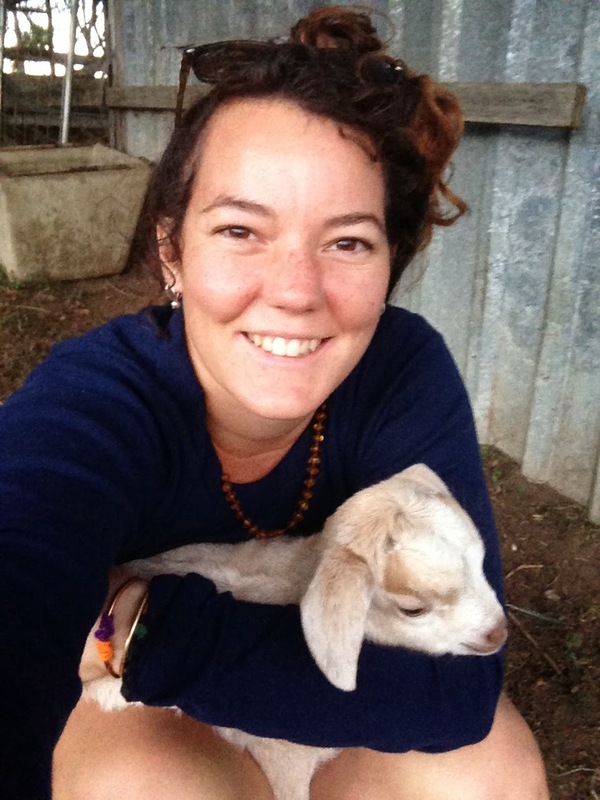 I cut and loaded up a ute-load and took it home for 'processing'. I chose a large, solid piece to build the Feeder and Water trough out of. This particular Bamboo is a species of 'clumping bamboo'. They grow tall and reasonably straight. 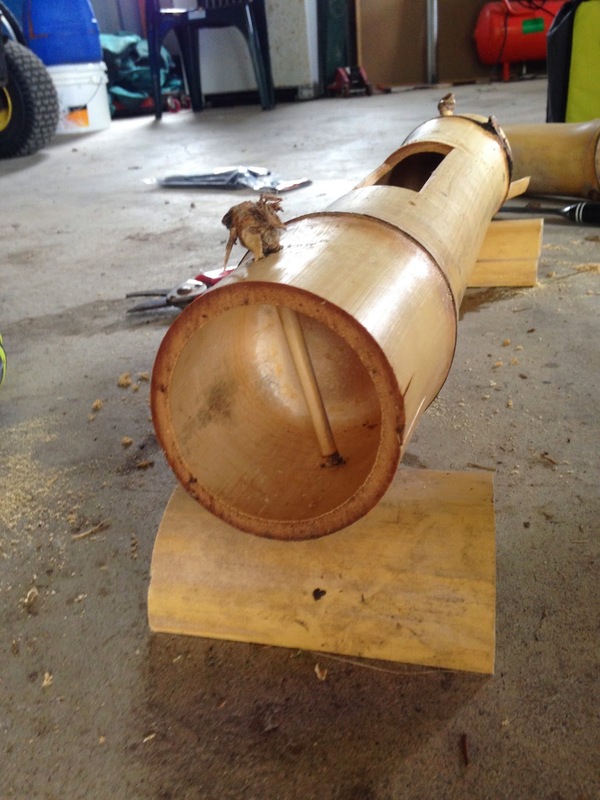 Bamboo consist of several segments, each segment is hollow and watertight. This is what I was planning on taking advantage of for the Water Trough. 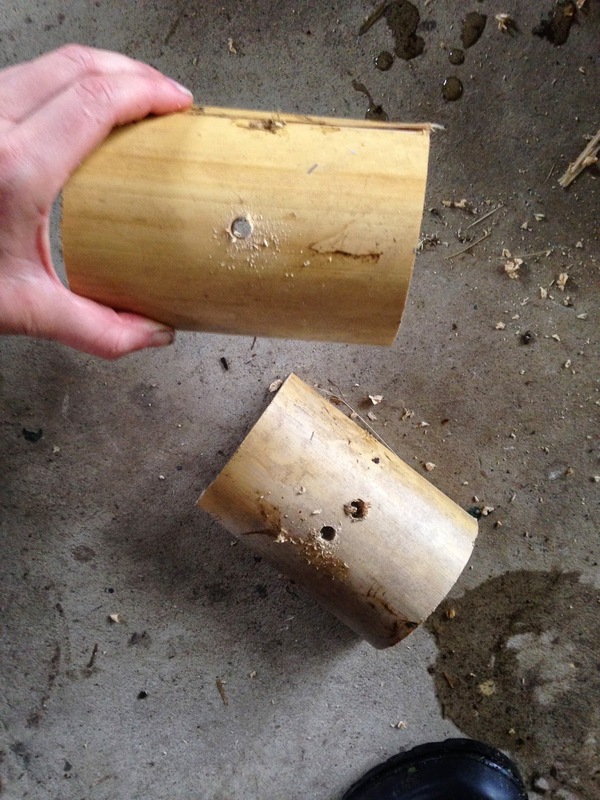 I sawed the bamboo on either side of the two segments so that I had one intact central piece. 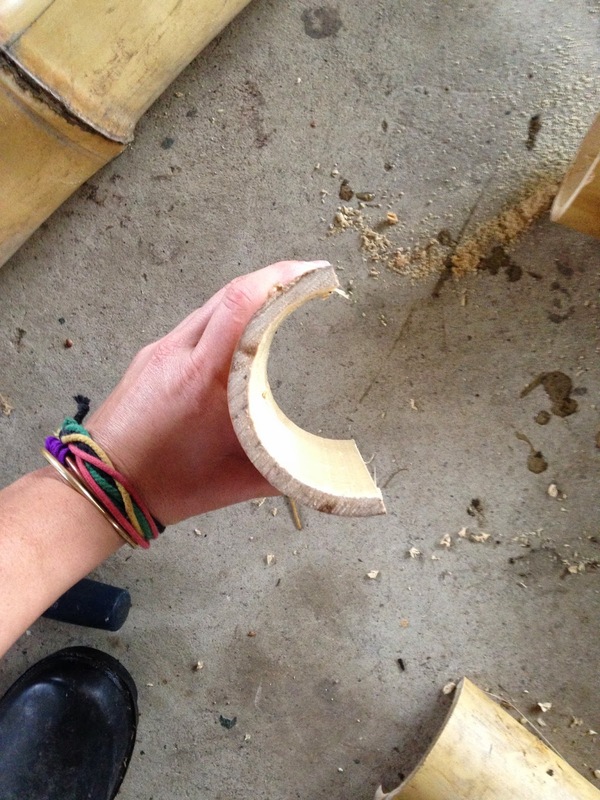 I then used the saw to cut two lines perpendicular to the bamboo piece. 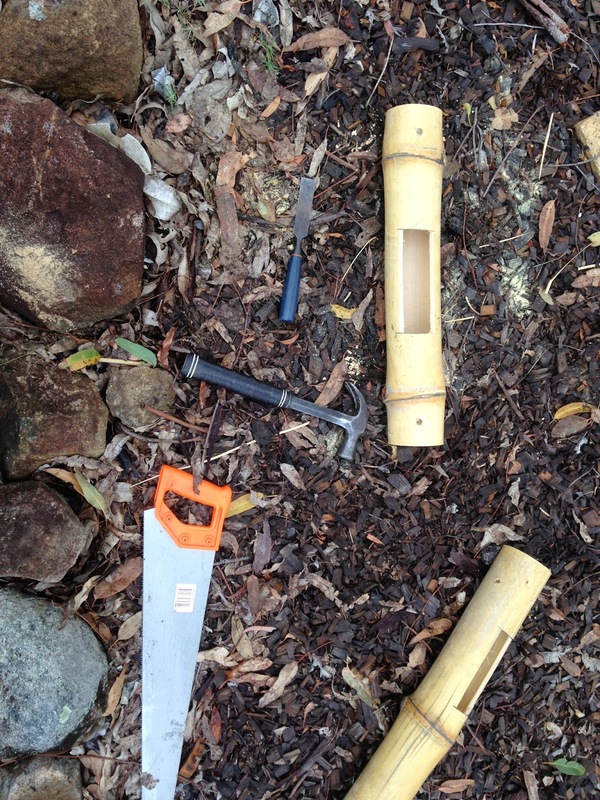 Using a chisel and a hammer, I chiseled along the piece of bamboo from one cut to the other cut. Then I was able to pop out the whole centre piece in one chunk. 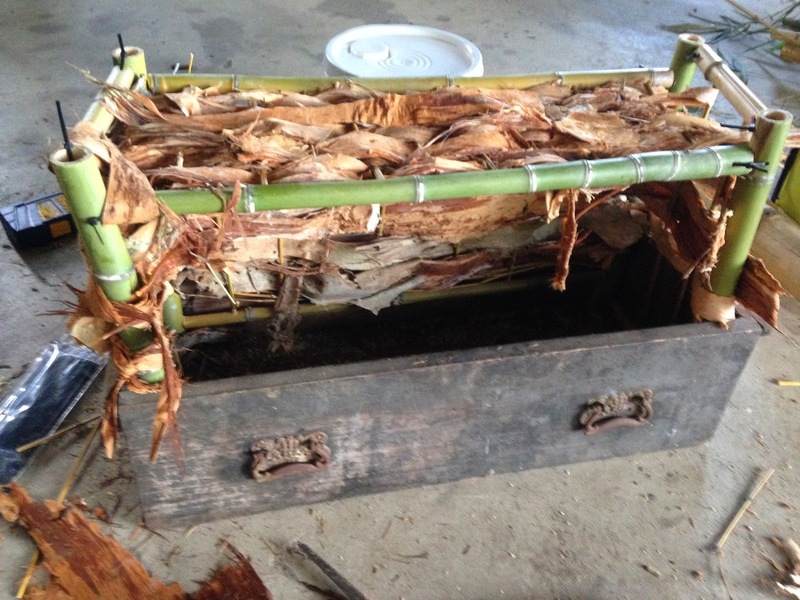 For this method to work, it is important to understand the structure of the Bamboo. 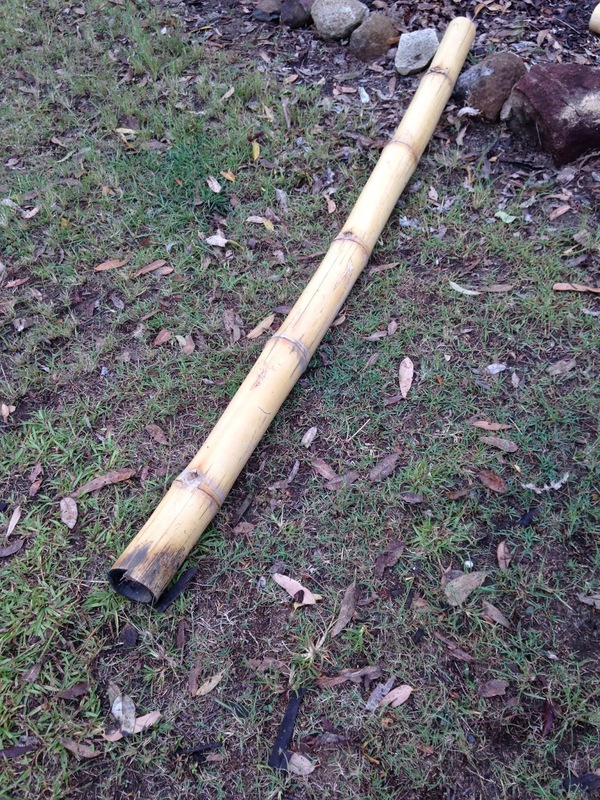 The bamboo fibres run vertically up the bamboo and it is prone to splits on the vertical plane. By using the saw to create vertical cuts, it is then very easy to split off the whole rectangular piece. Water Trough in-situ in the Chook Pen. 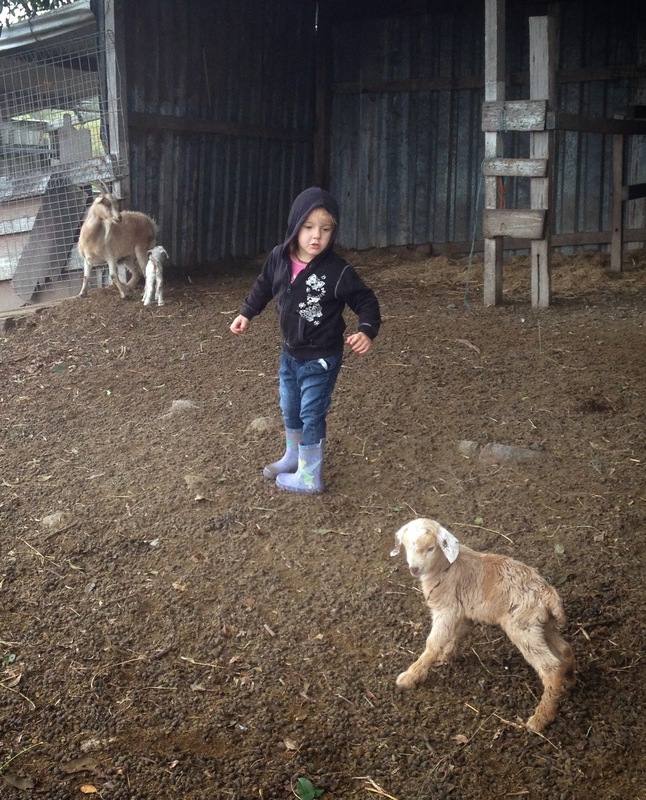 My parents were away for the weekend, so Gigi and I had their hobby farm all to ourselves. 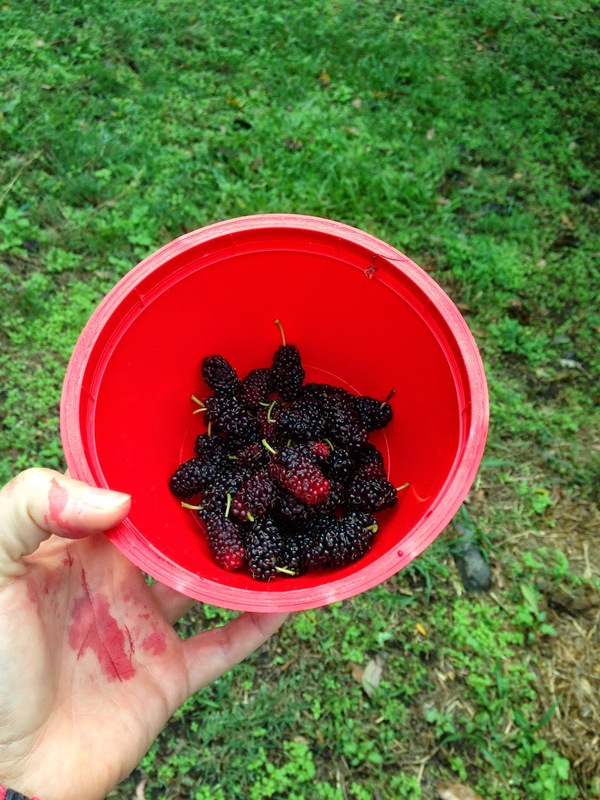 Its mulberry season at the moment and their Mulberry Tree is loaded. Gigi was eating them as fast as I could picked them. 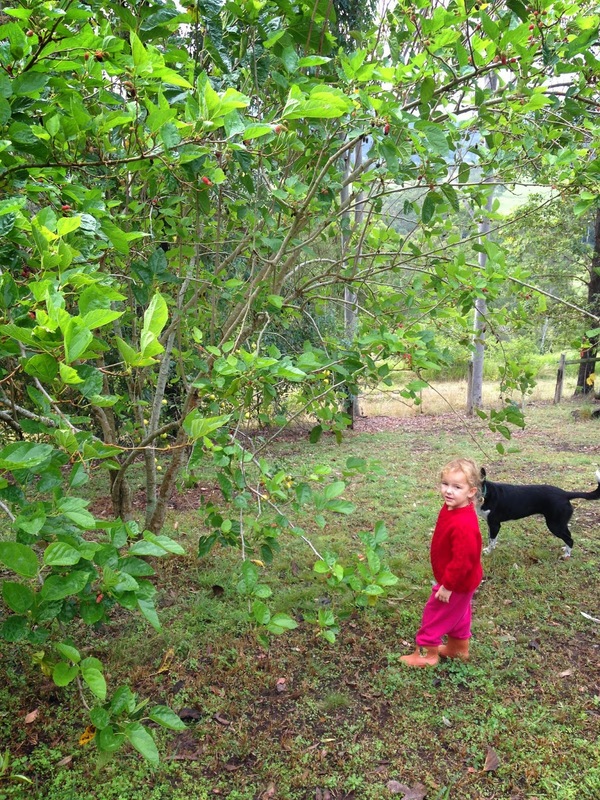 She'll be eating a lot of Yogurt with Mulberries, Porridge with Mulberries and plain Mulberries over the next few weeks. 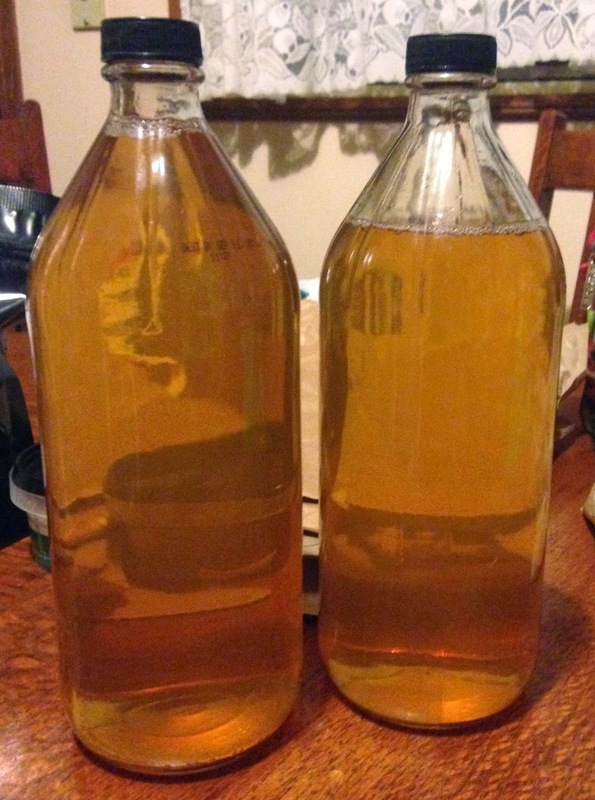 I'm also hoping to get enough to freeze some for later in the year. 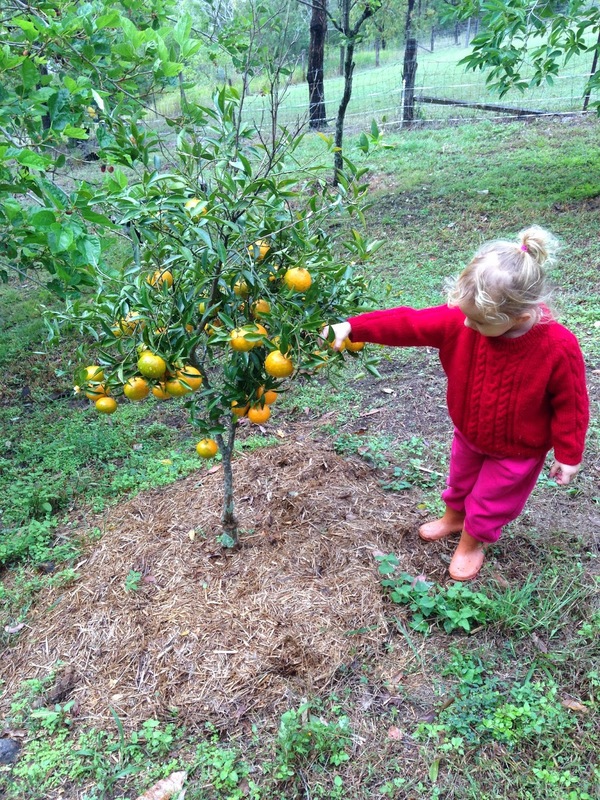 Being winter, the citrus trees are fruiting too. 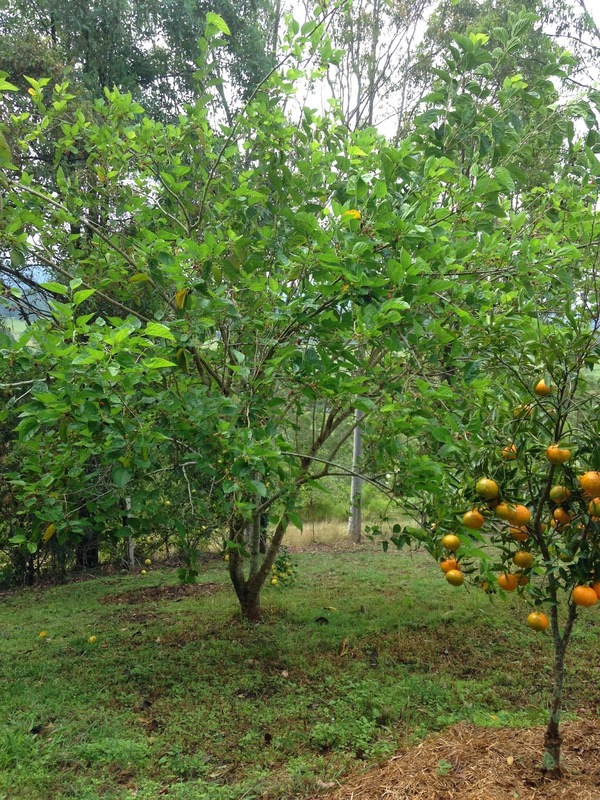 The mandarin tree, whilst small is loaded with small and extremely juicy mandarins. Gigi loves to pick and eat them. 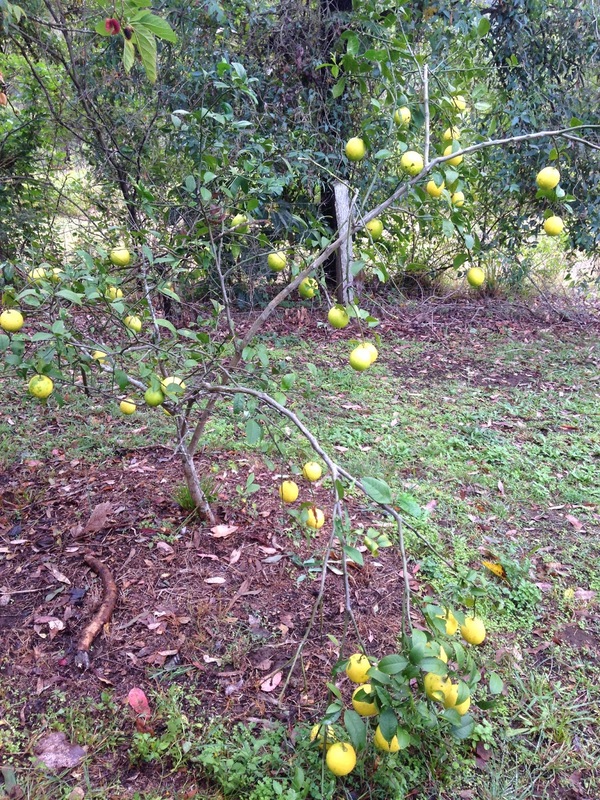 The lemon tree has lots of lemons this year. I'm not sure what to make with the surplus of lemons, nor how to preserve them, so I'll have to do some research. I may just end up gifting them. 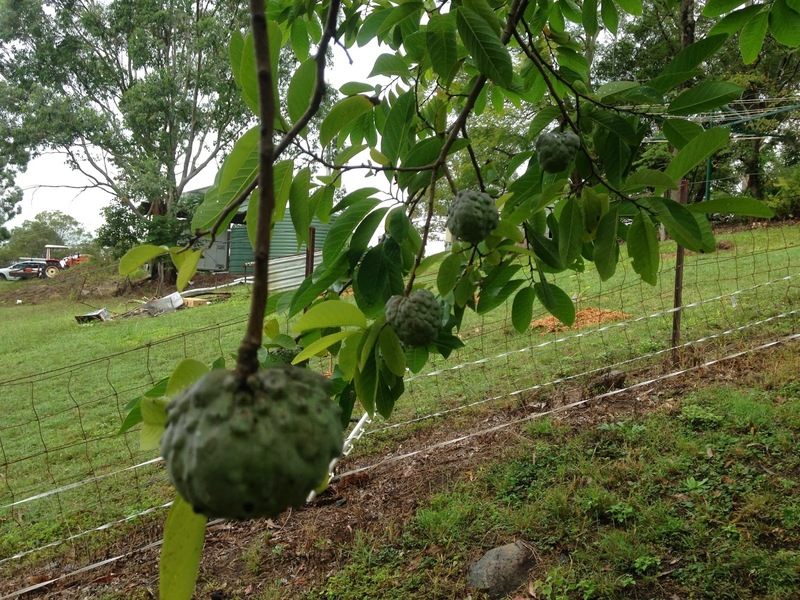 The custard apple trees have begun to grow perfect little fruits. Now begins the game of waiting for them to get big enough to pick, but picking them before the birds have a chance to destroy them. We had a bit warmer weather (for winter) over the weekend and also a fair bit of rain. 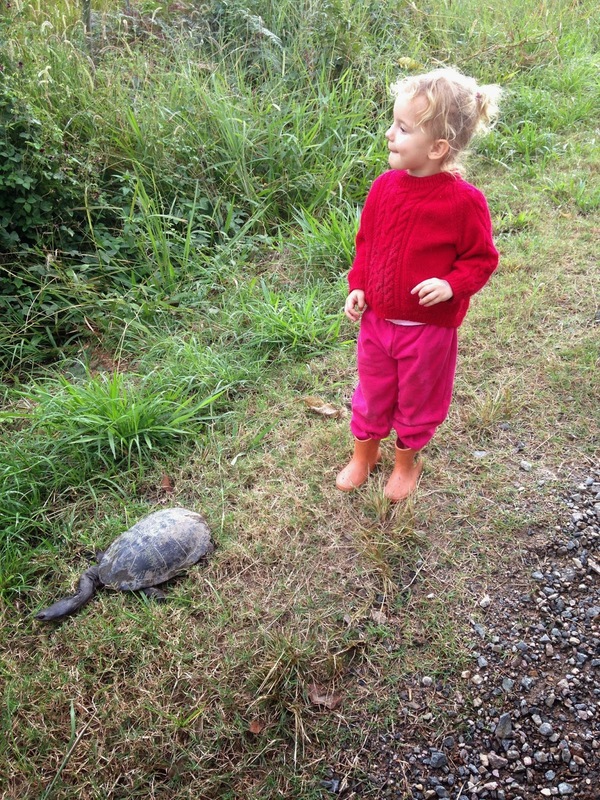 We found this little guy on the back road, heading for the dam. I picked him up and carried him over to the dam so that he wouldn't get run-over. He's the second turtle we've seen this year. This particular guy is an Australia Native, known as an Eastern Long-Neck Turtle. They are very common and this guy is getting close to the upper size limit of the species. 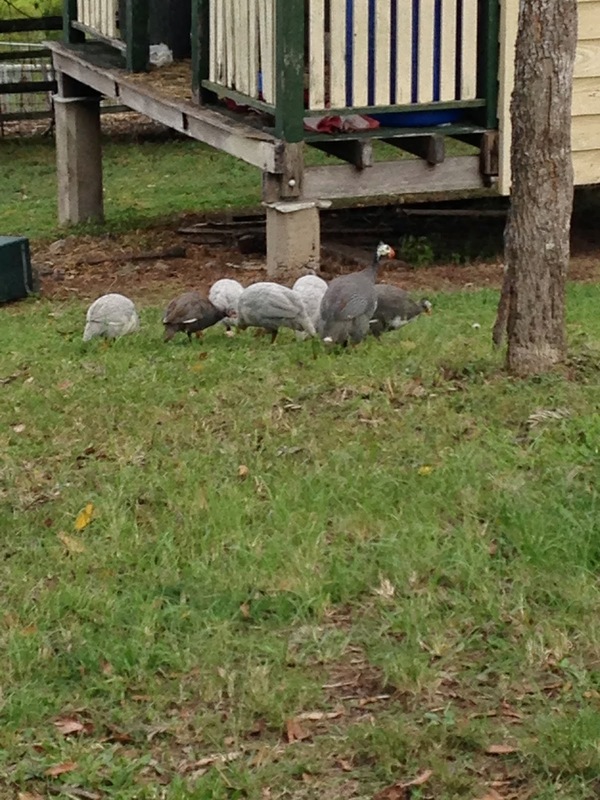 We also spent some time watching the Guinea Fowl, who are settling in nicely and are starting to extend their range. They came up to the house and we had to chase them away. Guinea Fowl by the house are NOT desirable!